If you are using SSMS and SQL Server 2005 sp2 You've probably tried out the database reports that are available in the Performance Dashboard, and decided how useful they are, but did you know that you can create your own dashboard reports? You’ve probably tried out the database reports that are available in the Performance Dashboard, and decided how useful they are, but did you know that you can create your own dashboard reports? The first step to install the Performance Dashboard is to install the msi file you downloaded from the link above. The installation process is similar to most msi installs. As you are going through the msi installation you may want to pause when you get to the “Feature Selection” panel of the installation. Here you will be given the opportunity to identify the “Installation Path” for the RDL files. The Installation path defaults to “C:\Program Files\Microsoft SQL Server\90\Tools\PerformanceDashboard\”. You can install the files associated with the dashboard anywhere, but you might want to consider a couple of things before you select a location. If you have a number of SQL Server machines, and a number of people that will want to use the Performance Dashboard then you might as well identify a network Installation path that is accessible by everyone that will be running the dashboard dashboard RDL files which might someday include your own custom reports. Once the msi installation completes, you will need to run the “Setup.sql” script that can be found in the installation directory you identified in step 1. The “Setup.sql” file is just a TSQL script that will installs a number of objects (functions and strored procedures) in the msdb database. The objects installed will be used to gather database performance information to help populate the different Performance Dashboard RDL reports. 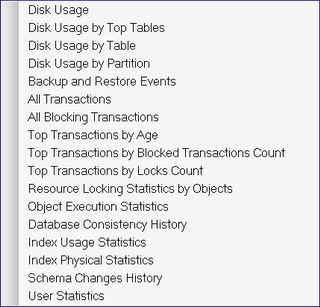 You will need to run the “Setup.sql” script on every instance that you want Performance Dashboard information from. 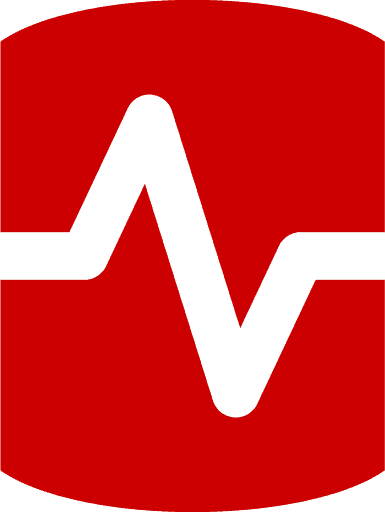 Run the Setup.sql file on each instance of SQL Server 2005 that you wish to monitor with the SQL Server 2005 Performance Dashboard Reports. Open the performance_dashboard_main.rdl file with the Custom Reports functionality new to Management Studio in Service Pack 2. 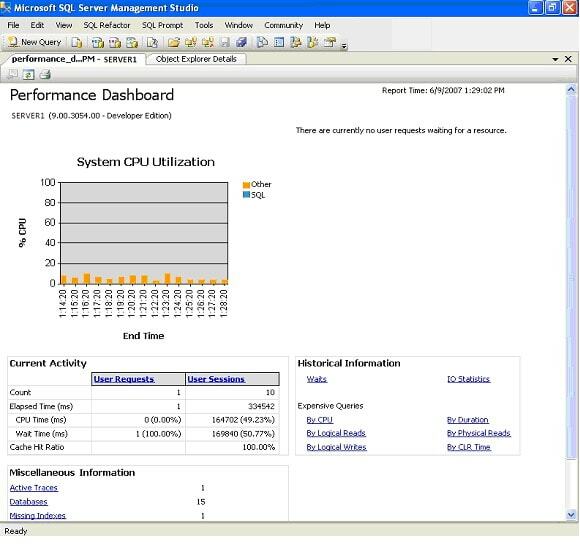 This main menu screen is displaying overall performance statistics for the developer edition of SQL Server 2005 running on my SERVER1 instance. On this report you can see overall “System CPU Utilization”, whether or not there are any requests are waiting for resources, as well as some current, historical and miscellaneous activity or information. There are a number of hyperlinks on this page that allows you to drill down and get more specific information regarding your server performance. 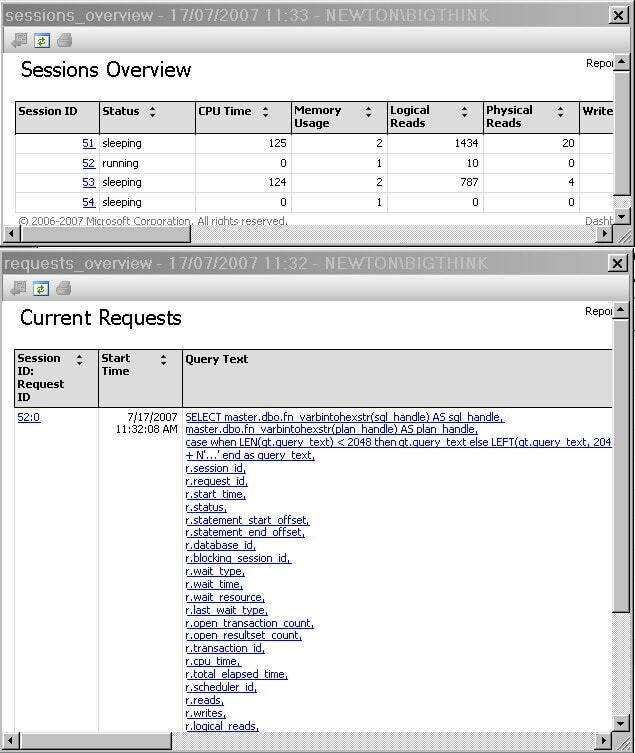 Below are a couple of drill down reports, one showing current sessions and the other that shows the most expensive requests. This report will show you the top 20 cached query plans that have accumulated the most CPU. From this report you can drill down even more to review query plans for an individual cached command. To see all 20 cached query plans you will need to use the scroll bar. The Performance Dashboard is a useful tool. I would suggest you install it and browse around all the hyperlinks to see all the valuable performance data this tool brings to SSMS. This tool demonstrates lots of different reporting capabilities that can be incorporated into SSMS by building custom Report Services reports. So now let me show you how you can build your own custom reports. The Performance Dashboard reports are just a series of Reporting Services RDL files. These RDL files query the instance you are on when you open dashboard and generate useful reports from the query result sets. You can use similar reporting capabilities to build your own custom reports. By using these object node parameters you can customize your report based on the object node you are on when you right click to display you custom report. We’ll look at a couple of example RDL files to demonstrate how this works. For my first example I am going to use the “DisplayObjectNodeInfo.rdl” file. This RDL file merely displays the SSMS object node parameters based on where you are at in the SSMS object explorer tree when you display this custom report. To run this report, copy the above file and store it somewhere that you have access to from a machine in which has the SSMS tool installed. Then within the object explorer of SSMS expand a database node, then the table node, and then right click on a particular table. On the menu place your mouse on the “Report” item and the click on the “Custom Report” menu item. From the “Open File” panel open the DisplayObjectNodeInfo.rdl from the location where you saved it. When you do this you should see the report being rendered, and upon completion of the rendering you should see an “AllReportParameters” report. This report shows you all the values of the object node parameters for the specific object you where on when you opened this customer report, like ObjectName, ObjectTypeName, Filtered, etc. To show you how you might use the object node parameters to make your report parameter driven I will show you a report that displays the record counts for every table in a databases. To run this demo you need to save the “RecordCount.rdl” file to some location where you can get at in from SSMS. After saving the RDL file, right click on a database in SSMS, go to “Reports” item, then click on the “Custom Reports” item. In the “Open File” dialog box browse to the location where you saved the above RDL file and open it. 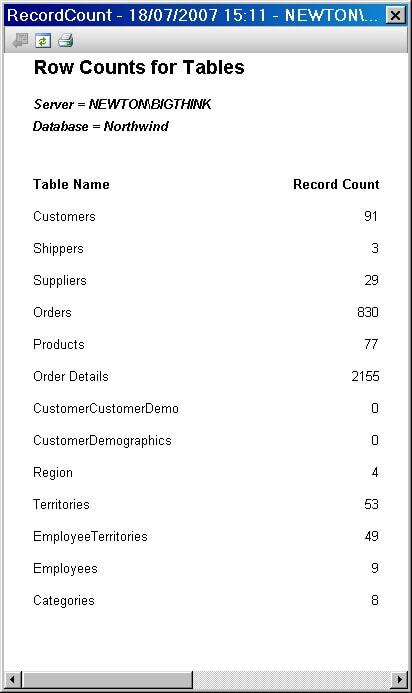 When you do that you will see a report that will show a record count for all the tables in your database for the specific database node you were on when you opened my custom “Record Counts” report. Now navigate to a different database node in SSMS, and bring up the report again using the same steps as above. This time the report should render a different report containing the record counts for the new node you selected. There is a limitation you should know about when using the any one of the object node parameters. These parameters are only populated for the first report rendered. So if you try to include one of these parameters in a drill down report it will not be populated with a value when the report is rendered. To get around this you need to pass an object node parameters you need in your drill down report from the first report rendered when selecting a custom report. Review Books Online for other limitations. While working with the custom reporting capability of SSMS I found a feature or, should I say, a quirk regarding the rendering process. When a report is rendered the information for your data source and database in your report is not used. But, instead, the node information from SSMS is used to determine what server and database your query should run against. This is great for those reports that you want to select data based on the database context. If you want your query to run against a specific database then you will need to use a three part naming convention (<databases>.<owner>.<object>) to fully qualify the objects you reference. To demonstrate this functionality save my RecordCount.rdl file to a location you can get at with SSMS. Bring up SSMS and right click on a database, then go to the “Reports” item, click on “Custom Report” and then browse and open up the “RecordCount.rdl” file. When this report is rendered you should notice that it displays records counts for the database you right clicked on. Now close the custom report and right click on another database then open up the “RecordCount.rdl” file again. This time you should see the new set of database record counts based on the second node you clicked on. With the installation of SP2 for SQL Server 2005 you now have the ability to easily incorporate your own Reporting Services reports into SSMS, without having to install Reporting Services. Being able to do this allows you to build your own reports to augment those provided with SQL Server 2005. By placing your own reports into SSMS you can now make SSMS your one stop shopping for all your reporting and database management needs. Next time you have a need to build a custom Reporting Services report related to database management, consider incorporating it into SSMS by using the custom report option. I am developing SQLDashboard App for my client using VB.NET 2005. I am wondering you e-mail me your source code of this topic. My client is still have sql server 2000. I appreciate a feed back. All the source code for those two custom reports I developed are available in this article by clicking on the RDL links. Keep in mind Custom Reports within SSMS only work against SQL Server 2005 databases. ‘rd’ is an undeclared namespace. Line 17, position 3. This article is just what i was looking for but when i try it out i get error. I’d like to say I know why you are getting that error. What version, edition of SQL Server 2005 are you running this on? Also what OS are you using. If you could also explain the steps you used to produce this error that might also help. I’m hoping I can build an environment that gets this error, so I can help troubleshoot this error. Sorry I’m not help here, but instead am justing asking question to narrow down the scope of when this occurs. Yup me too. Same issue with the rdl file. Any ideas on fixes? I’m running SSMS on an XP sp2 box with the rdl sitting on a 2003 sp1 machine. SQL version is 9.0.3175 on both machines. For those of you that are having problems, here is what components and version that Management Studio reports when I right click on “Help” and then click on “About…”. Are yours the same or different. I get the same “undeclared namespace” error as above, and I have all the latest versions installed. When I compare the DisplayObjectNodeInfo.rdl file (originating from 413-DisplayObjectNodeInfo.htm) with the existing SSMS .rdl files, then DisplayObjectNodeInfo simply seems to be incomplete. the existing ones start with “?xml version=”1.0 …” and “Report xmlns = “http://schemas …”. I am not experienced enough to make corrections, Leendert. “<Report xmlns=…” from an existing rdl file. DisplayObjectNodeInfo: works like a charm. With the RecordCountFile.rdl file I get an error: “… parsing Entityname. Line 81 …”, which refers to the line with “Parameters!DatabaseName.Value”. Sorry, I am to tired, to attach this one. Thanks, Leendert. 1. Make modifications as in my mail dd. August 04, 2007. 2. Modify “Database = ” & Parameters!DatabaseName.Value into “Database = ” + Parameters!DatabaseName.Value. Rationale: this is not VB. 4. Modify “b.index_id < 2” into “b.index_id in (0, 1, 2)”. Argument: I assume the original “< 2” conflicts with the XML/RDL syntax. Even better: put it in a stored procedure. As always, thanks Mr. Larsen, Leendert. No, no abusive language. But I just read the simple-talk Joubert, Part 4 article, that also deals with Custom reports, and saw that there is code download at the TOP of the article. Back to Larsen (that’s: here), and YES: code at the TOP. Let’s try it again: both examples work without any modification. So forget all my above corrections, and just don’t follow the links in the article body, bot use the two TOP links. 2. Consistency has some drawbacks too widespread. Absolutely correct, if you download the files they work, if you cut and past the code then they don’t. Happy now, Thanks Greg really usefull report. ‘object_schema_name’ is not a recognized built-in function name. while i am executing the “Setup.sql” i am getting the following errors. Cannot find the object ‘usp_GetPageDetails’, because it does not exist or you do not have permission. The first sentence in this article states that you should be running “SQL Server 2005 SP2”, which I believe the above statement should return 9.0.3042 for SQL SVR 05 SP2. Solution to ‘object_schema_name’ is not a recognized built-in function name. Thanks for contributing! Great to see people sharing their wealth of knowledge! I am also getting the same error but mine SP 2 is already installed does it work in SQL express editon. 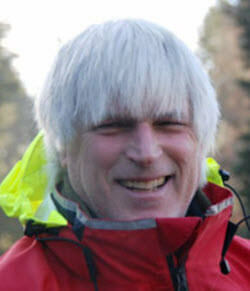 SQL 2008 needs minor modification to work! This is due to a change in the sys.dm_os_sys_info DMV from SQL Server 2005 to 2008 (the cpu_ticks_in_ms column was removed in 2008. I’m running SQL Server 2008, SP2 and was able to fix the ms_ticks issue with no problems & it ran successfully.